If youâ€™ve walked around a major city like San Francisco in the past couple years, youâ€™ve probably noticed cars topped with bulky, spinning discsâ€”the mark of self-driving vehicles in training. Inside those flying-saucer-like rigs are upwards of tens of thousands of dollars worth of lasers used for light radar (lidar). Lidar detects objects like cars, pedestrians, and bicyclists by scanning them with laser light, then measuring the light that gets reflected back. Itâ€™s a key enabling technology for self-driving cars. But those cars are going to stay in testing mode forever if lidar costs donâ€™t go down. Sydney-based start-up Baraja, which came out of stealth mode today, plans to provide a less expensive solution by repurposing key technologies from the telecom industry, says CEO and co-founder Federico Collarte. Instead of using moving parts and multiple lasers, the Baraja design uses a single multicolor laser and prism-like optics to split and scan its beam over a field ranging 30 degrees in the vertical and 92 in the horizontal. To get a 360 degree view, the company places four of these sensor sets on the roof of a car. Barajaâ€™s design places the laser in a small box inside the car, ideally by the onboard computer, well away from the elements. Light from the laser travels to the roof over fiber-optic cables. Each of the rooftop sensor heads contains prism-like optics that split the beam into an infrared rainbow, with hundreds or thousands of different colors each emerging at a slightly different angle. To sweep a particular part of the field, just change the color of the laser to the right band of the spectrum, and the prisms will send beams to the desired place. This takes less than a millisecondâ€”no moving parts required. The sensor heads are resilient, and can be submerged in water or blasted with a hose, says Collarte. The system can rapidly adapt to the circumstances, changing the visual field or providing more detail in a particular region by changing the color of the laser, says Collarte. The on-board computer might decide to use the lidar to get a more detailed look at who or what is in the crosswalk a couple feet away, or focus farther aheadâ€”up to about 250 metersâ€”when driving at freeway speeds. Lidar images are made up of matrices of dots, each of which represents a beam of laser light that reflected off a person or thing in range of the system. The resolution depends on how many of these dots are packed into each image, as well as the size of the light beam. Collarte says their images have up to millions of dots, and a resolution of about 10 centimeters at 100 meters. 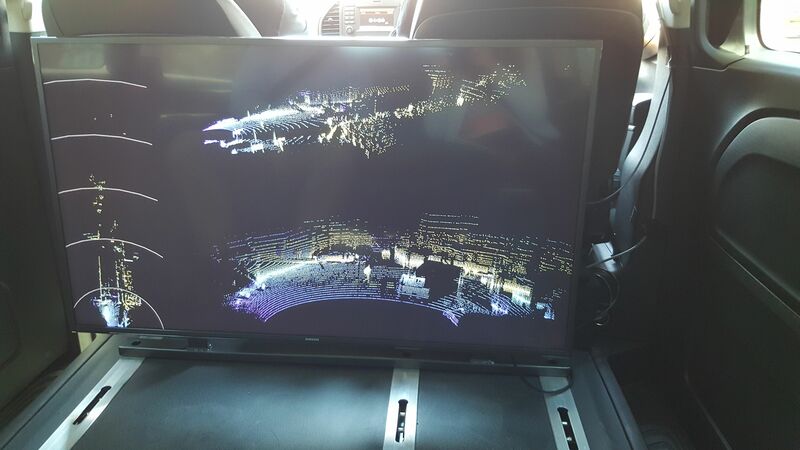 Riding in a van equipped with one of the sensor heads and a display in the back seat, Collarte explains what weâ€™re seeing on a real-time lidar video of the streets of San Francisco. Barajaâ€™s compact lidar system assembles dots of reflected laser light into an image of its surroundings. Weâ€™re in the booming Dogpatch neighborhood, so the environment provides plenty of pedestrians, trams, construction cranes, and cars. We start out looking at the world through 64 lines of lidar dots. Each line represents a different color of reflected light. At the touch of a button, Collarte doubles the resolution to 128 lines. The system can distinguish between more or less intense reflected beams, and displays them as yellow or blue dots. That means the bright, close crosswalk shows through bright yellow, while the road ahead looks a more vague, pointillistic blue. Collarte shows how the system can rapidly adjust the field of view to keep on focusing straight ahead when we go up and down a hill, or shift the focus to see a couple hundred meters ahead, which would be important during highway driving. Collarte and co-founder and CTO Cibby Pulikkaseril met while developing multicolor lasers at optics company Finisar. These lasers are used for wavelength-division multiplexing, which enables telecommunications companies to send or receive multiple colors of light on a single fiber optic cableâ€”the more bandwidth the better. The Baraja system has adopted a telecom laser that can emit a spectrum of wavelengths centered around 1500 nanometers, well into the infrared. Pulikkaseril says these telecom optics have several advantages. This wavelength is invisible to the human eye. And the sun doesnâ€™t emit much of this wavelength either, so that eliminates a potential source of interference. Pulikkaseril says heâ€™s thinking ahead to a future when there might be hundreds of lidar-equipped self-driving cars on the road. â€œIf you have hundreds of cars pulsing all this light out, you will get interference,â€� he says. Their system eliminates this possibility because the light has to come back at a certain angle, time, and wavelength, or it wonâ€™t couple back into the prism-like optics. Collarte says the company has been in talks with potential buyers while developing their designs, but is not currently announcing any customers.